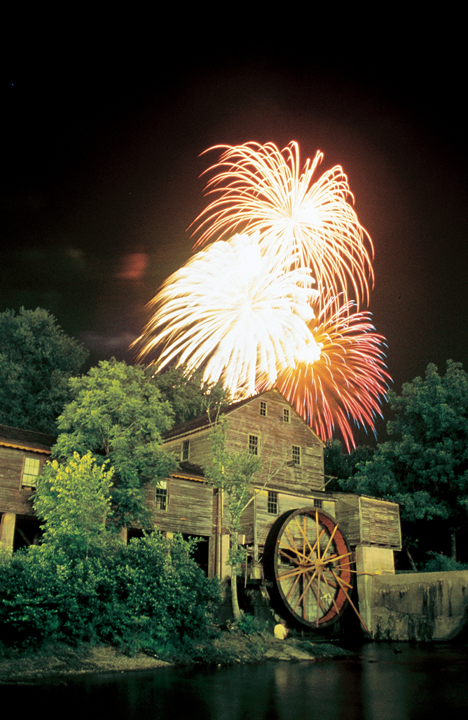 PIGEON FORGE, Tenn. – Pick a month, any month, and you’ll find a festival or special event in Pigeon Forge, Tenn. This resort town next to Great Smoky Mountains National Park really knows how to show you a good time. Every year starts with a mid-January salute to its neighbor with eight days of free activity called Wilderness Wildlife Week. There are classes, seminars, photography workshops, mini-concerts and hikes into the park’s 800 square miles of nature at its best. February’s big event is most unusual – a salute to cowboy poetry, western music and chuck wagon cooking called Saddle Up. In March, a softer side comes out for A Mountain Quiltfest. The city and various businesses organize the festivals and events, and a big organizer is Dollywood. The popular theme park punctuates its almost yearlong season with an international festival in spring, a fall festival for bluegrass music and barbeque, a Southern gospel music festival and then a spectacular Christmas celebration called A Smoky Mountain Christmas. The Titanic Museum attraction gets in on the fun with a January ice-carving competition, winter snowfalls across the bow of the museum (the building looks like the famous ship) and other programs. All of 2013, for instance, is marked as “The Year of the Titanic Children” and focuses on the 133 children on the famous voyage. Every May, thousands of people turn out for Dolly’s Homecoming Parade, which honors hometown superstar Dolly Parton. It’s all very Norman Rockwell – youthful twirling teams, high school bands, equestrian units – except that Dolly herself rides in the first float. Mixed in during other months are car shows devoted to hot rods and nostalgic classics, a knockout 4th of July concert and fireworks event, a huge autumn crafts fair and the Salute to Veterans Parade in November. Information about all events is online at MyPigeonForge.com or by calling 800-251-9100.